If you’re a serious meditator, you really need one of the best meditation cushions / meditation pillows and a good meditation mat too. A good meditation seat will massively improve your practice. It all comes down to posture. When you meditate, you need to have the correct sitting posture. When you sit properly you will focus your mind more easily. Plus, with good posture you will prevent knee and back pain while meditating. The best meditation pillows improve posture, and this helps both with your meditation and with your health. Because of this, we consider meditation pillows to be one of the most important pieces of meditation furniture items. But you want to spend your money wisely. So which meditation cushion should you buy? In my article on why seated meditations are possibly a bad idea, I discussed how bad posture is killing you. If you have bad posture when you meditate, you could be seriously damaging your spine. The best meditation mats and cushions can help you to sit comfortably when meditating and to correct your posture. 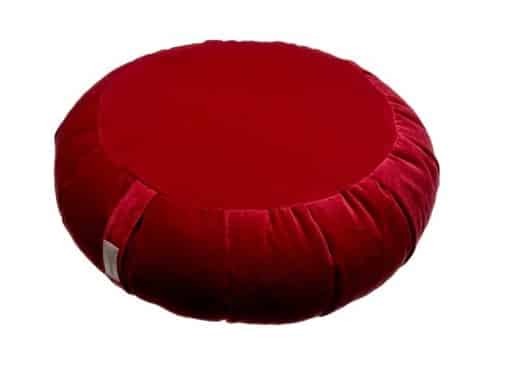 A traditional meditation pillow like a Zafu or Zabuton will correct your posture so you sit properly, supporting not just your meditation practice but your health too. Different meditators have different needs. Your height, weight, budget, reasons for meditating, and the space you meditate in… all these things effect your choice of meditation pillow. So let’s talk about the basics of buying the perfect meditation cushion for your individual needs. Before you go grabbing the first meditation cushion you see, there are a few important consideration to make. This will prevent you from wasting money on the wrong yoga pillow. What type of meditation you will be doing on your meditation pillow? 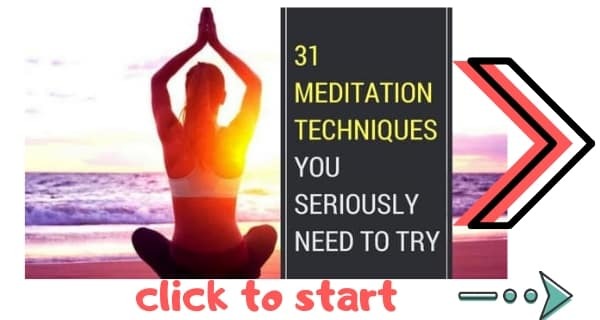 Take a look at my guide to 31 meditation techniques. I’ll help you choose the right meditation for you. This is important because some cushions are better for certain types of meditation. 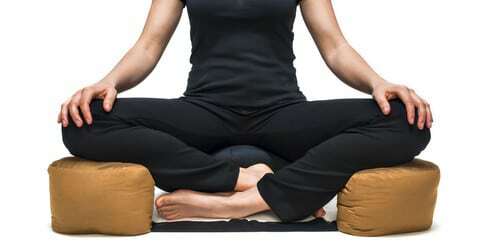 Zen meditation, for instance, requires kneeling, and therefore requires a yoga cushion that supports the knees. That’s why a good choice for Zen is a Zafu (a round meditation pillow also known as a putuan). Meditation mats are a good choice too. Other meditations are done sitting down, for which a different type of pillow is required (we look at the different options below). And still some meditations use shavasana (lying down to meditate). Decide which meditation technique you’ll be doing before choosing your meditation pillow. 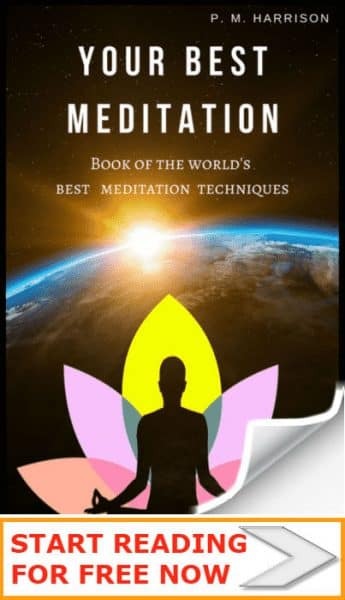 Many people have special requirements that require specific types of meditation cushions. 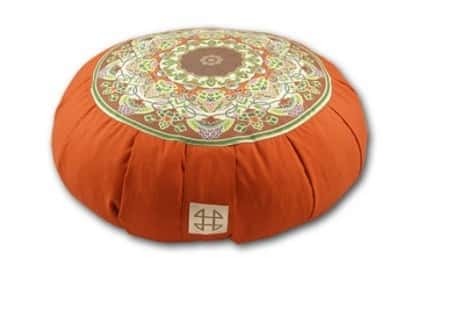 For instance, if you have spinal injuries you will need a meditation cushion that helps support your spine. 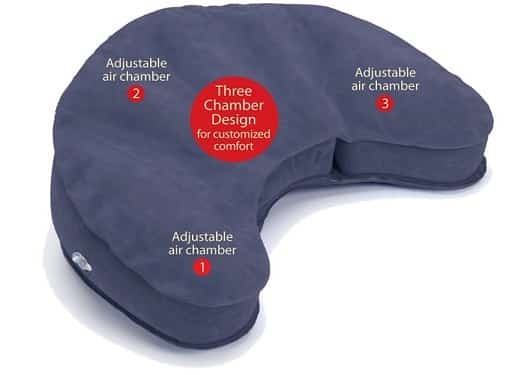 If you have an injury it should be your top priority to get a meditation cushion that supports the injured part of your body. Meditation cushions that offer special support will state so on the description page (or label). Where will the cushion go? How will the meditation pillow fit with the decor of the room? What color will you get? Does the pattern / design matter? Naturally you want your meditation room to look beautiful and it will probably feature other items like a Buddha statue, for instance. Therefore, it’s a good idea to know your color schemes before you choose a yoga pillow so your overall room ends up looking beautiful. The average person spends a long time sitting. That’s why proper posture is vital. Your body needs proper support when you’re sitting or you may suffer a spinal injury. If you are meditating for a long time in the wrong position you’ll put pressure on your spine, your legs, your gluts, everything. Want to pay for a chiropractor? So make sure you’re posture is right. Meditation cushions, mats, yoga bolsters, blankets… these are all items that help you to get into the right posture. You need a meditation pillow or meditation mat that supports your posture. Proper posture means that your spine is erect with your lower back curved in (lumbar support, people). Your upper back is going to be a little bit curved and your head and neck should feel like they are floating lightly towards the ceiling. You will know when you have the right position for meditation because it will feel as though your spine is holding itself up with zero effort. Check your spine. It should have natural curves and feel comfortable. Stay seated for 10 minutes. You should not have any discomfort. Feels cozy? Great. It’s a keeper. If you are buying a meditation cushion online you obviously will not be able to test it. You can make up for this by looking for reviews from people with similar needs. Which Meditation Pillow For Which Posture? Best meditation pillow for kneeling . These types of cushions give a lot of support to your upper body and reduce the pressure on your knee joints, which helps to reduce the chances of injury. A BackJack Chair is one of the best options for sitting positions. Backjacks chairs are sturdy floor chairs usually filled with foam. For maximum support on your lower back you might also like to use a round cushion with your backjack chair. This will help to get your spine in the right ‘S’ position. 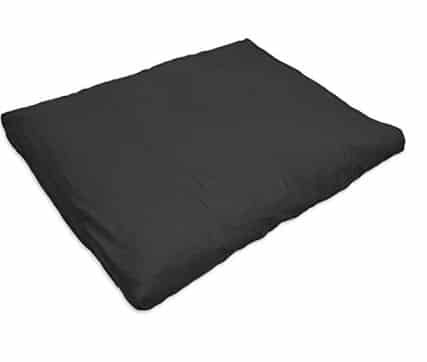 Best meditation pillow for Lying Down (shavasana). A yoga mat is one of the best options for lying down. These offer you basic support for your whole body. You can also add a yoga bolster and yoga blanket for extra support under your knees, back and neck. The first step to finding the perfect meditation cushion is to determine what broad-range category you’re going to be getting. These are the traditional cushions that are used in Zen meditation. Zafus are generally round and have a pleated cushion. The benefit of a Zafu is that it lifts your body up in such a way that your legs and spine are comfortable. You will generally position yourself on the edge of your Zafu so that the hips are rolled forwards lightly. This slight movement helps to get your spine into proper alignment. Most Zafu are fine for people of regular height and weight. If you are a little taller you might like to get a higher Zafu that gives plenty of room for your legs, otherwise you will feel cramped. This is a very stylish cushion that looks like a children’s drawing of a butterfly. Cosmic Ccushions feature a built-in slope that helps to make sure you sit in the proper position. Cosmic Cushions are wide, which produces plenty of support for the legs when you’re sitting in full-lotus position. Overall, this is an excellent choice and particularly good for taller people. Rectangular meditation cushions are by far the most practical type of cushion in terms of room space. You can put most cushions away easier than other types of meditation cushion. You might find that with a rectangular meditation cushion you need to fold your legs in more, which is fine for those of us who are particularly flexible but could be challenging for other people. These are excellent cushions for supporting your ankles and knees. If you have knee injuries I recommend you purchase a zabuton. Usually Zabutons are put under one of the other types of meditation cushion. This provides additional support and will help make sure that you sit in the right position. So now you should have a pretty good idea of what type of meditation pillow you’d like to get. The next consideration is what colour cushion you’d like. 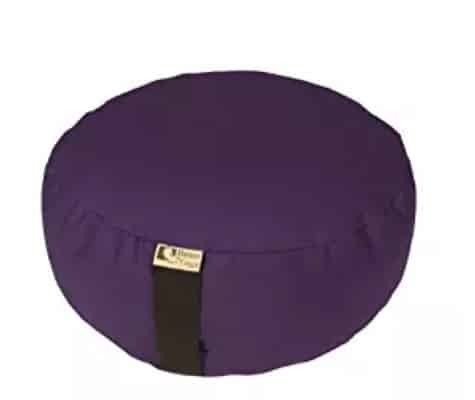 The colour of your meditation cushion should promote the state of mind that you want when you meditate. Red: The warmest colour. Creates feelings of love and passion. Green: Connects you with nature and produces balance and calmness. Blue: The most relaxing colour. Helps you to calm. Black: Black is a serious colour that produces feelings of authority. This will make you respect your meditation more and will encourage you to get deeper into meditation. Orange: A positive colour good for happiness and positivity. Yellow: Produces feelings of joy. We now know basically everything about choosing a meditation cushion. Here are my personal picks of the best meditation cushions. The Zafu Yoga cushion looks modern and is highly fashionable. It’s filled with buckwheat from the USA, making it eco-friendly. You can take out the filling and easily wash the material. Best of all, this cushion is available in 16 different colours, meaning you’re bound to find one that fits with your home decor. 94 reviewers have given this cushion a review score of 4.5 out of 5 and it’s easy to see why. This is the absolute best cushion to take with you when you travel. It’s light, meaning its easy to pack and to to carry, and it’s easy to inflate. Ergonomically designed, this cushion is so very comfy you’ll find yourself taking it everywhere and using it often. This is one of the newer sets on the market and is perfect for both meditation and for practicing yoga exercises. I personally put the cushions from this set around the tea table (they make quite nice home decorations). The zabuton is extremely comfortable. I’ve had many students on the zabuton and they all seem to really like it. The set has 4.5 stars from 21 reviews. Personally, I don’t really like the design of this cushion. It’s an ancient East indian pattern which simply doesn’t match my home decor at all. It is one of the most comfortable on the market. It uses AXIS innovation technology to promote good posture. You’ll be able to sit for hours in complete comfort. A truly excellent cushion. This 100% cotton meditation cushion contains 3 1/2 inches of stuffing and provides excellent support while remaining completely comfortable. There’s a zipper along the side that you can use to take the stuffing out and wash the cushion. The batting inside is in a cotton casing. In terms of design, this cushion comes in a variety of different colours, all of which are in the classic style. A buckwheat cushion that is designed for long periods of sitting, this cushion feels simply perfect. 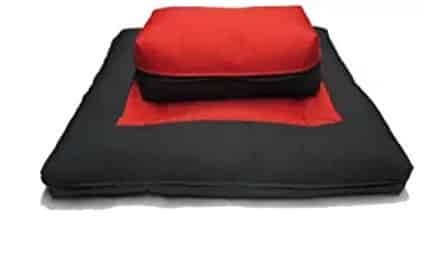 Not only will this meditation cushion help you to remain comfortable during long meditations, it will also help you to improve your posture. The handle along the side of the cushion is a nice touch too as it makes it easy to carry the cushion from one place to another — it’s a small detail but it saves a lot of hassle. I highly recommend all of the meditation cushions. Pick your favourite and grab it today! Which is your favorite pillow? 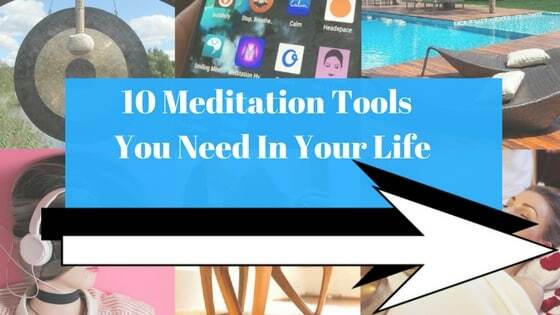 And now you’ve got the perfect cushion, it’s time to consider these essential meditation tools.